Journey to the Enchanted Land of Faery Bright as the sun rising from the mists of faery land are the shinning images of the Faery Wicca Tarot. Each symbol reflects a truth designed to make your life decisions wiser your spiritual journey richer. 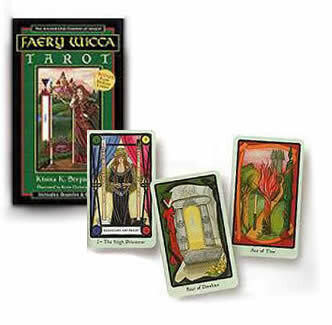 The Faery Wicca Tarot blends the mystical power of Irish mythology, the ancient Irish Faery Tradition, and modern Faery Wicca into a wondrous tool for inner transformation. Each of the 83 cards captures a Bardic teaching designed to lead you along a spiritual passage through the wisdom of the ancients, culminating in a shamanic journey to the Otherworld of Faery. Fifteen spreads specially designed to reflect the ancient mystery teachings will help you make positive life changes, divine your best course of action, and awaken greater psychic perception.